Maintaining cognitive function is a prerequisite for living autonomously in older age and it is highly desirable to postpone cognitive decline for as long as possible. In order to understand how cognitive function is shaped across the life course, it is necessary to focus on life course influences on cognitive aging. 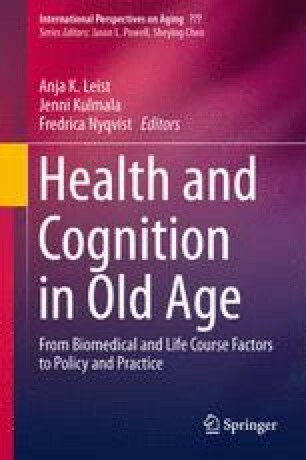 The chapter gives a selective review of current knowledge on life course influences on later-life cognitive function with a particular focus on the most recent developments in research on cognitive reserve between 2008 and 2013. First, the theoretical framework of cognitive reserve and life course epidemiology is introduced. Then, an overview is given on life course influences that have been shown to shape later cognitive function, with a focus on important factors of social and behavioral nature, such as education, work environment, and social and physical activities. New research on contextual factors, such as neighborhood socioeconomic status, schooling laws, and retirement policies is then presented. The chapter ends with prospects for further research. Dr. Anja K. Leist has been supported by the Fonds National de la Recherche, Luxembourg (grant INTER/FLARE2/10/01). We would like to thank Dr. Blossom Stephan for helpful comments on an earlier draft of this manuscript.